The victorious COPS A team. 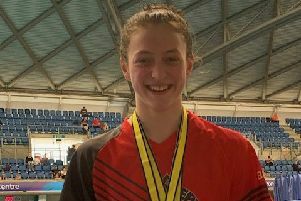 There was double delight for City of Peterborough Swimming Club (COPS) at the weekend in the National Arena League. The club’s A team retained the East Midlands Premier Division title for the fifth year running in fine style while the COPS B team were equally impressive in winning the Division One crown to clinch promotion. That means COPS, a club with just 123 members, will have two teams in the Premier Division next season. The win by COPS A means they will go through as regional champions to the National Arena Cup Final, which is the blue riband event for club competition in England. Final Premier Division scores: COPS A 255pts; Northampton 205pts; UEA Norwich 175pts; City of Milton Keynes 163ps; City of Cambridge 126pts ; Lincoln Vulcans 124pts. The COPS victory owed much to girl power with the female swimmers picking up 19 wins and and the male swimmers six wins. Katie Brown and Daniel Leigh got them off to the perfect start by winning their individual medley events and the city clib went on to win nine of the 16 relay races. The COPS A team members were: Katie Brown (16), Mollie Allen (17), Anna Blakeley (13), Stella Blakeley (11), Katie Brown (16), Fabien Brudnicki (11), Stuart Clarke (33), Finn Corbett (15), Jade Goode (12), Josh Graves (18), Matthew Gray (15), Thomas Hanley (11), Brenna Howell (11), Herbie Kinder (13), Liam Knight (21), Olivia Lee (11), Mia Leech (13), Poppy Leech (15), Daniel Leigh (16), Amelia Monaghan (13), Harvey Norman (14), Henry Pearce (13), Poppy Richardson (14), James Rothwell (11), Matthew Rothwell (13), Leah Roughan (16), Jamie Scholes (15), Connor Walker (11), Rachel Wellings (15), Hallie White (11) and Tom Wiggins (16). After several years of ‘near misses’ the COPS B team finally gained promotion from Division One on their own patch at the Regional Pool. Final Division One scores: COPS B 248pts; Lincoln Pentaqua 193pts; Calverton & Bingham 184pts; Norwich Swans 146pts; Melton Mowbray 141pts; St Ives 133pts. It was again the COPS girls who formed the bedrock of the result by winning all but one of their 25 events and the one they didn’t win was decided by just three tenths of a second! The boys managed six wins. Becky Burton (17) got COPS Boff to a flying start taking the 100m individual medley by a 2.33-second margin. The final two relay events provided a fitting finale to the evening with the ladies open freestyle team of Bethany Saunders, Taylor Goodby, Rebecca Burton and Christie Woods winning by 4.44 seconds and, not to be outdone, the men’s squad of Cameron McRae, James Newton, Matthew Brigham and Michael Lardner provided a thrilling finish by winning their event by just .75 seconds. The COPS B team members were: Matthew Brigham, Jack Brown, Oliver Brown, Rebecca Burton, Sophie Crowther, Cameron Fisher, Ben Garton, Taylor Goodby, Sophie Griffin, Erivan Hamid, Lauren Harrison, Holly Jaszkiewicz, Michael Lardner, Jessica Mahoney, Charlotte Martin, Cameron McRae, Yasir Naimi, Matthew Newson, James Newton, Toby Norman, Bert Papworth, Harriet Salisbury, Bethany Saunders, Maddison Saunders, Will Steel, Madeline Todd, George Whiteman, Harry Whiteman, Kenzie Whyatt, Christie Woods and Eve Wright.